During the last two decades, Central Asian states have witnessed an intense revival of Islamic faith. Along with its moderate and traditional forms, radical and militant Islam has infiltrated communities of Muslims in Central Asia. Alarmed by the border incursions, sporadic terrorist violence and religious anti-governmental campaigns, the leadership of all Central Asian states adopted extensive measures against radical Islam and intensified counterterrorism policies. 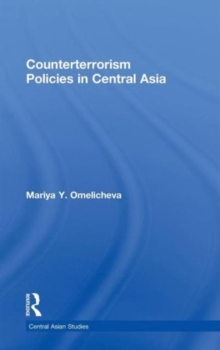 This book examines the dangerous tendency of counterterrorism policies of the Central Asian states to grow more alike amid propensities for divergence and attributes this trend to the impact of the social context in which these states operate. It underscores the importance of international setting that shapes governments' perceptions of terrorism and their counterterrorism policies. Applying a comprehensive theoretical framework, which integrates different mechanisms of international influences on state behaviour, the author explains the Central Asian states' perceptions of terrorist threat and their counterterrorism responses. The book analyses the counterterrorism policies of Kazakhstan and Kyrgyzstan, the two Central Asian states that have been least affected by terrorist violence and Islamism but chose to combat those threats vigorously. Using materials derived from a wide range of sources, including legal documents, officials' memoirs and fieldwork, this research will contribute to studies in Asian politics and national security, and international relations.